This Antique Victorian Bangle Bracelet exudes Quality and is truly gorgeous in its design and styling being wide, thick and heavy. The top features a cloud shaped cartouche not yet engraved with a monogram – Very Rare! – flanked by a beautifully fashioned Acanthus foliate design. The attention to detail is amazing. The back and interior are plain and smooth and the clasp is opened by pushing the tab down firmly. Its hidden hinge is perfect and the clasp snaps closed securely. This bangle bracelet has a warm Antique yellow gold hue with a subtle hint of rose pink and the silky feel usually associated only with solid carat gold. Maker: W. J. Braitsch & Company in business from 1895 – 1921 specialising in Silverware, but also had a jewellery line. Their trademark W.J.B. is stamped on the inside. Weight: a hefty 46.8 grams! It is in Near MINT Antique condition. It is clear this Heirloom Quality bangle has been used very little - there are no dents, damage, wear or repairs evident. 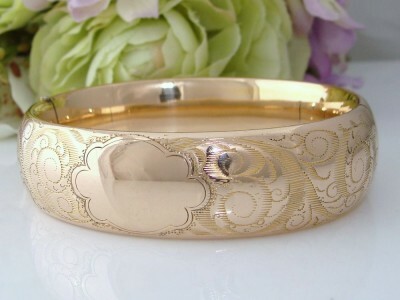 This is a truly beautiful bangle bracelet that WOW factor on the wrist. What a great addition to any jewellery collection. The photos do not do justice to this and you will be thrilled.